Alongside their D5 announcement, Nikon has also introduced their new DX-format flagship for 2016, the Nikon D500. This DX-format camera shares some of the new features released with the D5, like their new Multi-CAM 20K 153-point AF system and the ability to capture 4K UHD video. Other core features include a 20.9-megapixel DX-format (APS-C) CMOS image sensor, EXPEED 5 processor, burst shooting at up to 10fps, and native ISO settings from ISO 50 to ISO 51,200. See the Nikon press release below for more details. 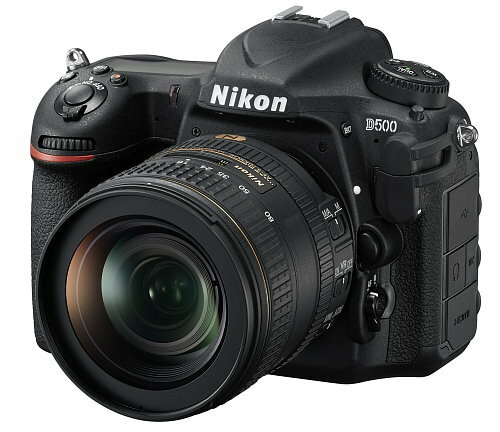 LAS VEGAS, NV (January 5, 2016) - Today, Nikon Inc. announced the D500, a DX-format DSLR with pro-level features that gives photographers nimble handling, speed and extreme processing power in a compact and lightweight body. With amazing imaging capability, robust build quality and lightning fast performance, the D500 is sure to satisfy as the highly sought-after successor to the venerable D300S. Like its sibling the D5, the D500 benefits from Nikon's latest technological innovations such as the totally new, blazing-fast Multi-CAM 20K 153-point AF system and 4K UHD video capture, yet adds a fun new way to share photos with Nikon SnapBridge built-in. "Nikon has answered the call from photographers to once again re-invent this camera category and offer an unmatched combination of performance and value that is hard for any photographer to resist," said Masahiro Horie, Director of Marketing and Planning, Nikon Inc. "When paired with the amazing imaging capabilities of legendary NIKKOR optics, photographers can capture intimate portraits, mind-blowing macros or action from extreme distances- the possibilities are endless." 1Wireless Remote Controller WR-R10 and WR Adapter WR-A10 (both available separately) required. WR-R10 firmware must be updated to enable support for radio-controlled Advanced Wireless Lighting (see Nikon's website). 2The Bluetooth® word mark and logos are registered trademarks owned by Bluetooth SIG, Inc. and any use of such marks by Nikon Corporation is under license.